A video based solely in Lancashire, an area bounded by Manchester, Liverpool Southport and Wigan. Starting at Manchester Victoria we travel to Kearsley and then see unique footage of “LION’ at Eccles on its original route of the Liverpool and Manchester Railway. Next Patricroft and the coal fields of Walkden. Wigan Wallgate for 2-6-4T and Crab 2-6-0. South to Earlstown, Widnes and St Helens. The push-pull service through Warrington, Widnes and Ditton Junction. Edge Hill yards and shed take us to Liverpool. On to Southport to travel the line to Preston via Crossens, Hesketh bank and New Longton when there were still steam worked services. Liverpool Exchange to Preston via Maghull, Ormskirk and Burscough Junction. Return to Liverpool is via the Wigan to Kirby line. Mainly filmed between 1964 and 1968. A fourth volume of our series on the lines of the Lancashire and Yorkshire Railway. Firmly in Lancashire, this film will delight all that loved the scenes towards the end of steam in the North West. It covers an area from Burnley to Blackburn and south to Bolton, Horwich and Chequerbent. Mostly filmed in sunny bright weather by competent cameramen, we see Rose Grove at its best (or worst!) with duties over Copy Pit. 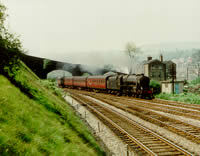 8F’s struggle up the Padiham branch and run freely through Huncoat to Accrington. West to Blackburn, Pleasington and Hoghton summit. South of Blackburn, we follow the now singled line through Sough Tunnel to Entwhistle and Bolton. We visit the shed there before moving west to Horwich to see the passenger service to Chorley worked by 84xxx tanks. An in depth look at the Chequerbent incline from the lineside, guards van and footplate, trains having to be split to just three wagons because of the severity of the climb. Although the odd 2-6-4 tank and WD 2-8-0 appear, the most prolific engines were the Black 5′s and 8F’s but all are beautifully filmed, another fitting tribute to the end of steam in the North West and Lancashire in particular. Another fascinating look at the railways using ex-L&Y lines. This video is firmly in Lancashire, Preston and the Fylde. Preston was complex with L & Y and LNWR routes to its main station. Sadly the East Lancs side has now completely disappeared. Using archive film from 1962 up to 1968 this video covers all routes to Preston, from the south and out to the north-west onto the Fylde and Blackpool. It covers all the many junctions and types of traffic passing through, freight, coal, cement and of course the busy passenger traffic especially to Blackpool. See Farrington yards, a birds eye view of Preston station, Lostock Hall shed and a glimpse of the Preston North shed after it had burnt down. 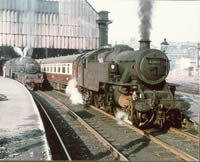 The Longridge branch was visited by a Super D in 1962, Preston Docks had steam up until 1968. 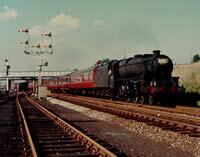 Specials pass through, we cannot show a Southern engine but there is an LNER A2 and a GWR Castle. Jubilees, Royal Scots and the occasional Duchess appear. The two routes to Blackpool Central and North are covered, this time a Clan and an LNER A1 put in appearances alongside LMS and Standards. See the pick-up freight at Lytham St.Annes and visit Blackpool Central shed. Twelve cameramen filmed for this video including Eric Woods whose still material has been published in the “Glorious Years” features of Steam Railway magazine. 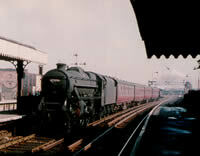 His cine film was rare too and this video overs the Glorious years of steam around Preston. In this title we leave Yorkshire and head for Lancashire via the ex LNWR route from Heaton Lodge Junction, through Huddersfield and the climb to Stanedge. 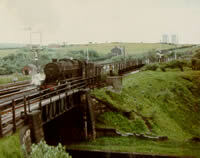 Local enthusiast Geoff Lumb of Huddersfield filmed almost yard by yard from Springfield Junction to Stanedge tunnel. This involves virtually all the types of traffic and locomotives to be seen from 1963 to 1967. So summer extras (just look at the stock on some of the trains), coal trains westwards, empties returning, general freight, and oil tank trains feature with Jubilee, Black 5, Crab, 8F, 9F, WD and 2-6-4 Tanks as motive power on this six mile climb over the Pennines mainly on a 1-in-105 gradient. As in Part 1snow scenes are included, this time at Longwood. Then it is down the other side of Stanedge through Diggle to Stalybridge. Although not Lancashire or Yorkshire specifically, there is a look at the Woodhead Route over the Pennines with excellent footage at Guide Bridge including steam and electric traction running side by side. To return to our route for Manchester we journey via Denton Junction to Miles Platting and are now on L & Y territory. There follows a look at traffic through Newton Heath before a journey with Fowler 2-6-4 Tank 42343 over the L & Y railway lines of Middleton Junction, Rochdale, Whitworth branch, Royton and Oldham Werneth ending at Manchester Ducie Street Goods. Finally a look at Manchester Victoria station which is our stepping off point for Part 3!